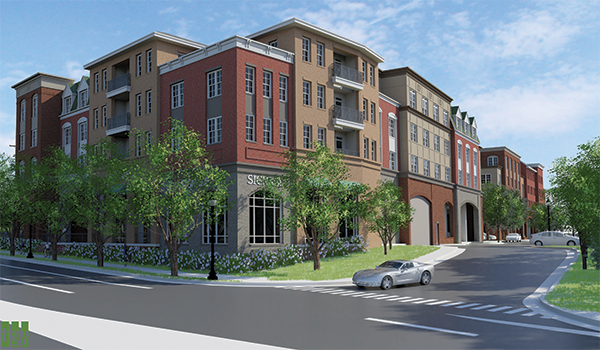 The four-story building would include retail space and 160 apartments. Rendering courtesy Hekemian & Co. Inc.
A New Jersey developer is pitching a mixed-use development project along the main commercial stretch of Vienna, but residents have raised concerns about its design. Hekemian & Co. Inc. of Hackensack, N.J., wants to construct a four-story building with 160 apartments and about 20,000 square feet of retail space on a 2.76-acre site at the corner of Maple Avenue West and Nutley Street NW. To move forward with its roughly $60 million proposal, Hekemian needs the property rezoned by the Vienna Town Council to become part of the Maple Avenue Commercial Zone, Bell says. Some residents, however, worry the proposal would undermine Vienna’s small-town charm. Steve Potter is a founding member of Vienna Citizens for Responsible Development, which is critical of Hekemian’s proposal. Potter prefers a plan that has more roof height variations and green space and less of an impact on traffic. “We were quite shocked,” Potter says of first seeing Hekemian’s plans. He says the biggest concern is the design and density of the building. Laurie DiRocco, Vienna’s mayor, says feedback has included concerns about the bulkiness of the proposed building and its potential impact on traffic. In August, Hekemian waived a deadline for a rezoning decision, allowing more time to discuss the project. The council now is scheduled to consider the issue at its Oct. 29 meeting. “It’s a positive thing for us to do this so that we can all talk through the issues and come up with the best design proposal for the site,” Bell says.